In today’s business world, you need to know what information you have, where it is and how to get it when you need it. Infoscan has the talent and ability to help you create a fully functional, compliance-minded records retention program to suit your needs. Whether it is for compliance reasons or to better utilise the space in your office, we are able to access, evaluate, move, store, archive and index your information in ways that make practical and economical sense. 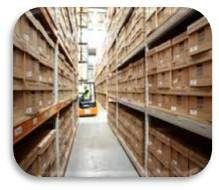 We offer a full line of document storage services, from archive storage to active file management.